Most men do not use resistance bands for strength training because they do not often see their value or believe that traditional free weights and weight machines will make them stronger. According to Juan Carlos Santana, director of the Institute of Human Performance in Boca Raton, Florida, resistance band training develops better eccentric strength (force reduction) because you have to control the tension of the band when you return to its original length. It should be part of any man's workout to develop speed, stability, strength and power. The body matrix concept was developed by physical therapist Gary Gray of the Gray Institute where you take a basic exercise, such as a lunge or push-up, and move in all planes of motion (sagittal, frontal, transverse). The push matrix with the resistance band, you combine a standing pushing movement with lunging in different directions. This works your entire body while developing proper movement patterns and core stability. Hook the band around a standing cable column hook and adjust the height of the point of attachment to about your heart level. Face away from the point of attachment and grab both ends of the band in each hand. Stand with your feet together with your elbows tucked in close by your ribs and bent. Then you step forward with your left leg and lunge down, pushing both arms in front of you. When you step back up, you will feel the band pulling you back. Control your balance and movement as you return to start position. Repeat the push and lunge with the opposite and alternate legs per rep. Do 10 to 12 reps for one set. Then step to the side with your left leg with your knee and toes pointing forward and push forward with both arms. Return to start position and do the same for the right side. Alternate legs for 10 to 12 reps for one set. The pull matrix is the opposite movement pattern of the push matrix and provides the same benefits. Face the cable machine and stand with your feet slightly apart. Hold the ends of the band with both hands with your arms extended in front of you. Step back and pull together, squeezing your shoulder blades together. Return to the start position and do the same for the opposite leg. Do 10 to 12 reps for one set. Then step to the side and pull, using the same form as the push matrix. Do 10 to 12 reps for one set. 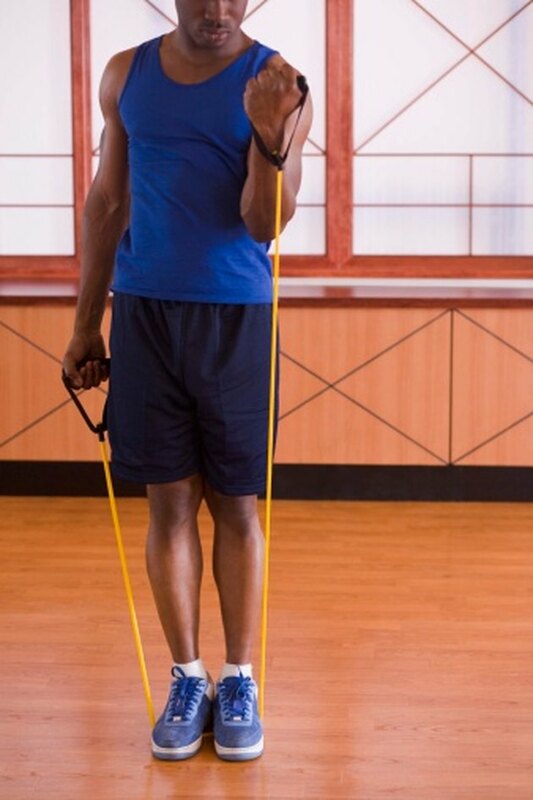 Both exercises strengthen your core and shoulders by using resistance band attached to a hook on a cable pulley machine. With the handle set at the highest height, hold the ends of the band with both hands, pull it diagonally across your chest and push it to the opposite hip. You can do this standing up or kneeling down. This lift is the mirror image of the chop, where you set your handle to the lowest height. Pull the band up and diagonally across your chest and push it above your opposite shoulder. Do not move your torso, hips, or legs throughout the exercise. Do 8 to 12 reps per side for 2 to 3 sets.